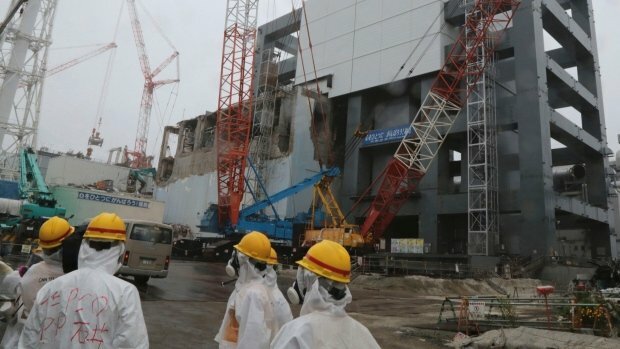 Stricken Fukushima nuclear plant has begun removing fuel rods from a storage pond at the Unit 4 reactor building. The delicate operation is seen as a necessary step in stabilizing the site. It will take more over two days to remove the first 22 fuel rod assemblies, plant operator Tepco says. Overall, more than 1,500 assemblies must be removed in what correspondents describe as a risky and dangerous operation set to take a year. Experts say hydrogen explosions after the earthquake and tsunami in March 2011 have made the current storage facility vulnerable to further tremors. The fuel rod assemblies are 4-metre long tubes containing pellets of uranium fuel, and the fear is that some may have been damaged during the disaster. When the tsunami struck, water knocked out cooling systems to three of Fukushima’s reactors, which went into a state of partial meltdown. Unit 4 was undergoing maintenance, so all of its fuel rods were being stored. But a build-up of hydrogen triggered an explosion in Unit 4, damaging its structure. The removal process, which has been preceded by months of repair work and planning, began on Monday afternoon. “At 15:18, we started to pull up the first fuel assembly with a crane,” a spokesman for Tepco (Tokyo Electric Power Company) said. A recently-installed crane is being lowered into the pool and hooked onto the assemblies to place them inside a cask. The fuel rods will then be deposited into a more secure storage pool with a cooling system. Experts say it it vital that the casks are watertight so the rods have no contact with air – which risks overheating and possible contamination. Yoshihide Suga, Japan’s top government spokesman, said he hoped the operation would be done properly. “We hope that this [process] will be conducted in a manner that will not disturb local residents, and that the removal will be done on schedule, properly and safely,” he said. Tepco spokesman Masayuki Ono called the operation “a very important process in moving ahead with the plant’s decommissioning”. Nuclear Regulation Authority Chairman Shunichi Tanaka has warned that rubble from the blast in the pool could pose a problem, Kyodo news agency reported. “The fuel has to be handled very carefully. There is a need to make sure that a fuel assembly is not pulled out (from the fuel rack) by force when it gets stuck because of the rubble,” Kyodo news agency quoted him as saying. The Fukushima nuclear power plant has suffered a series of setbacks in recent months, including a series of toxic water leaks and worker errors.